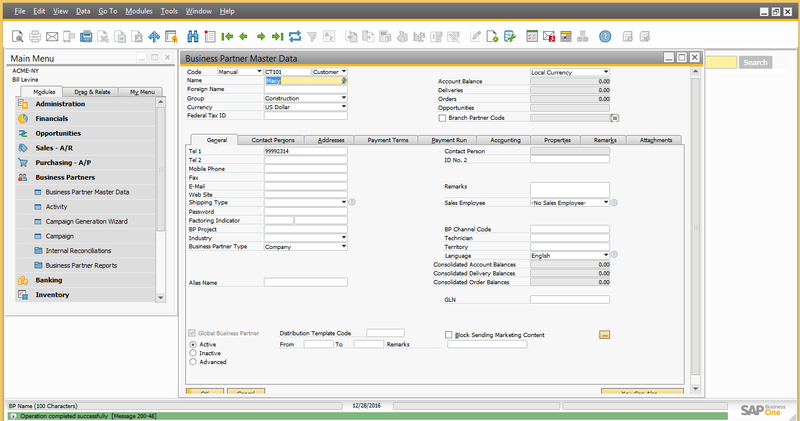 The Intercompany integration solution for SAP Business One offers data authorization and alert administration feature for master data replication and intercompany transactions. 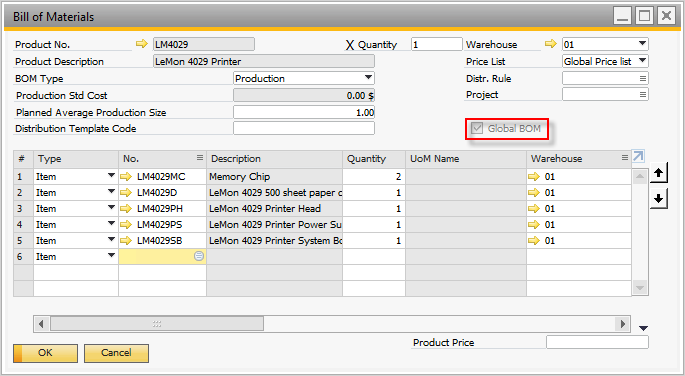 Global data authorization feature of intercompany solution enables administrators to set up authorizations for users to add, update, and remove global business partners, global items, global bill of materials, and global price lists. In intercompany solution, a Global record is a record which is replicated to all branch companies. 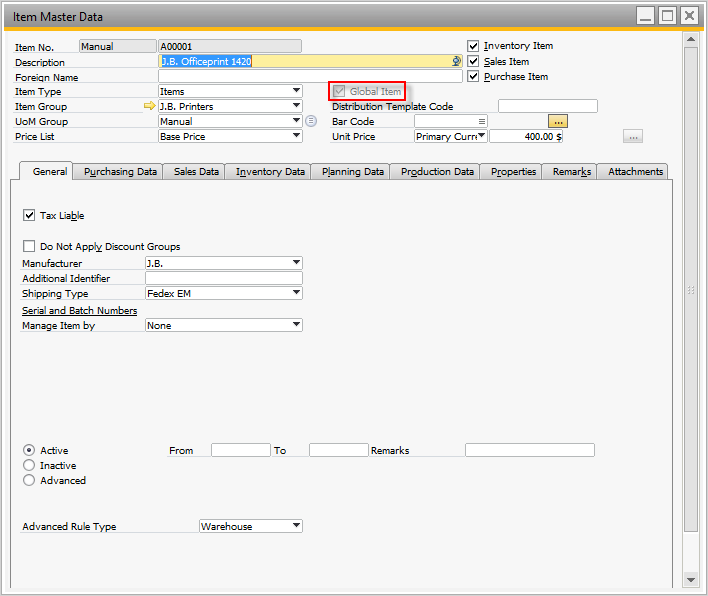 In case of item master data, business partner master data, bill of materials and price list masters, the user can choose the specific records that are to be shared between partner companies. The Global check box is provided on these masters, so that the user can select the specific record(s) that are to be shared across SAP Business One companies. 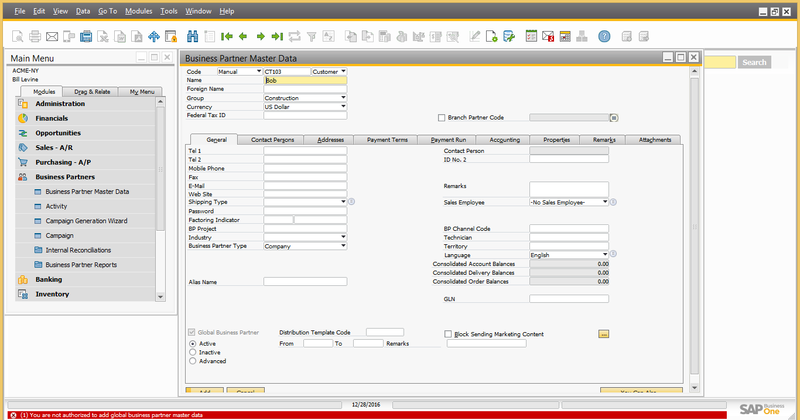 With the help of authorizations feature in SAP Business One, administrator can restrict the user to view, create, and update the complete masters. 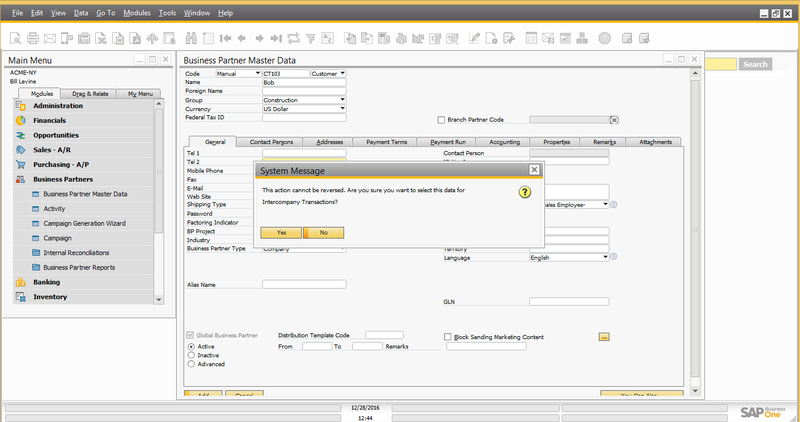 However, the authorizations feature in SAP Business One cannot be specifically used to add, update or remove the Global masters. The Intercompany Global data authorization feature help you to achieve this. 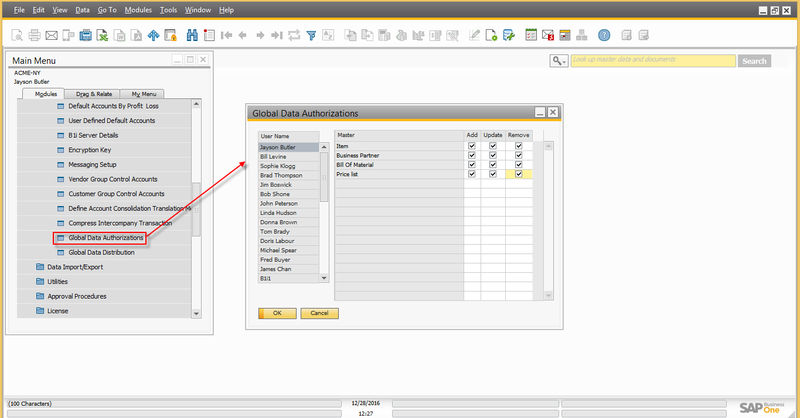 On Global data authorization screen, a list of all users is displayed on the left hand side and on the right hand side, system provides the Add, Update and Remove authorizations. As seen above, Jayson Butler (manager) is having all add, update and remove authorizations. And as seen below, user Bill Levine can only update Global Masters Records. Let’s login in SAP Business One as Bill Levine and test the authorizations assigned to him. Bill Levine was asked by his colleague to add a new Global customer in the Head Office. Bill Levine starts to add new Global Customer – CT103 in the Head Office company. 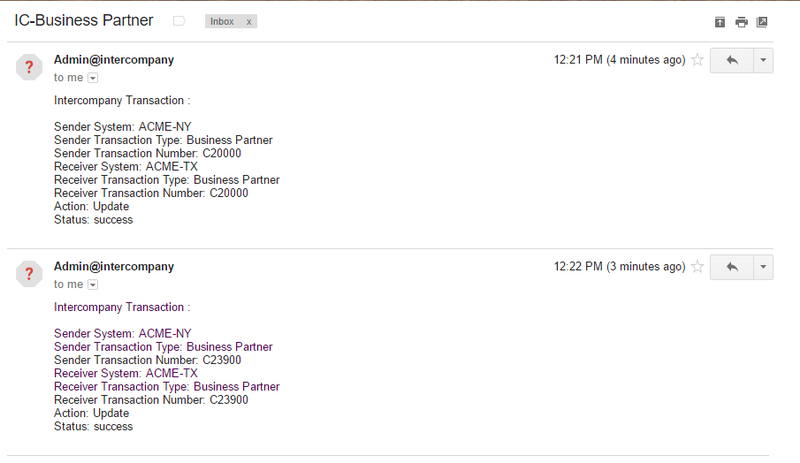 As a Global customer, Bill Levine needs to select “Global Business Partner” checkbox. On pressing “Yes” on prompt and choosing Add button. Let’s try to update an existing Global Customer “CT101”. Bill Levine updates the customer telephone number and press update button. The update is possible since Bill Levine has the update authorization. 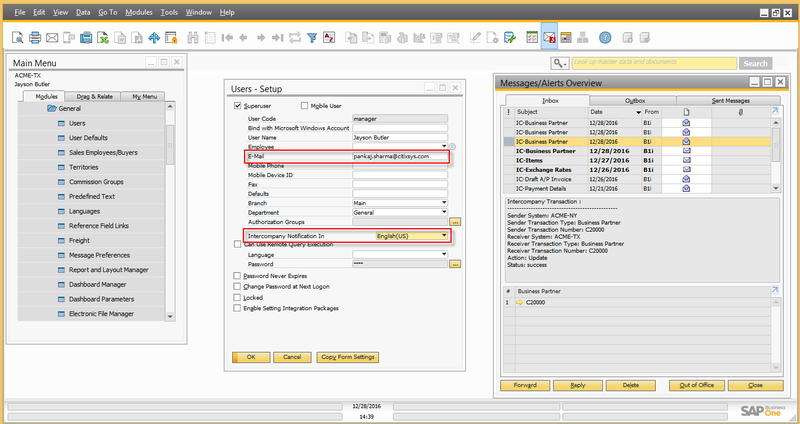 The Alert Management feature of the Intercompany solution notifies the user whenever an Intercompany transaction is received in the branch companies. 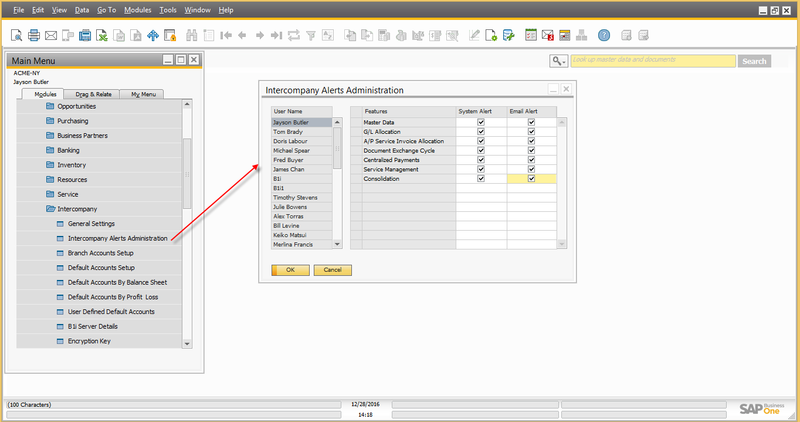 You can use the Intercompany alert administration window to setup the alerts in the system as shown below. In Intercompany alerts administration window, a list of all users is displayed on the left hand side and on the right hand side, system provide the list of all intercompany feature and check boxes to enable the system or Email alert in the system. 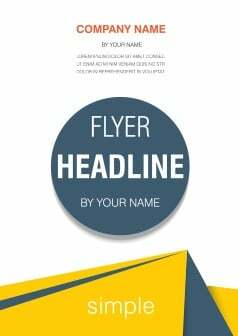 The receiving company can be notified of the above transactions by system alerts or email, as defined in the receiver company’s setup. As seen above, Jayson Butler (manager) is having system and email alert enabled for all intercompany transactions. So, when Jayson Butler logs into the system, all alerts for intercompany transactions appears in Messages/Alerts overview window. 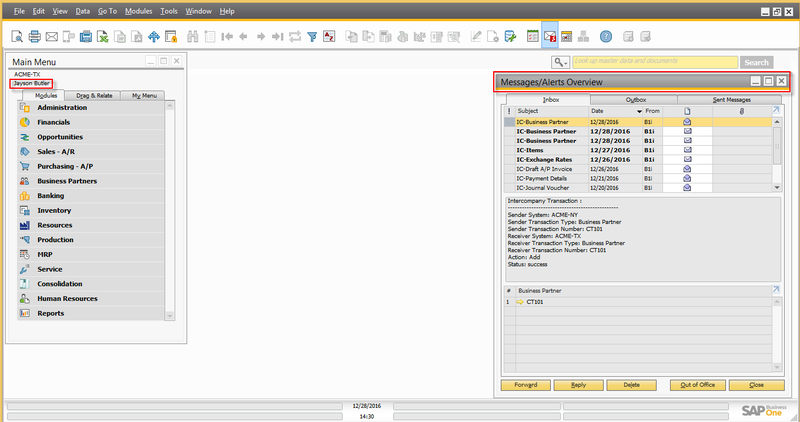 Find a list of all blogs on Intercompany integration solution for SAP Business One in this central blog.